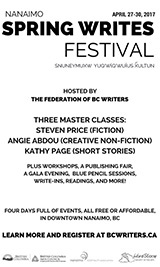 Submission Call to Writers in Victoria, B.C. 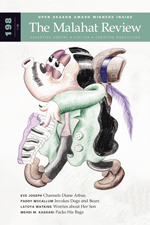 The Malahat Review is pleased to launch its 200th issue in the fall of 2017, and to celebrate 50 years of Canadian literature, the issue will be dedicated entirely to Victoria poetry, fiction and creative nonfiction past, present, and future. 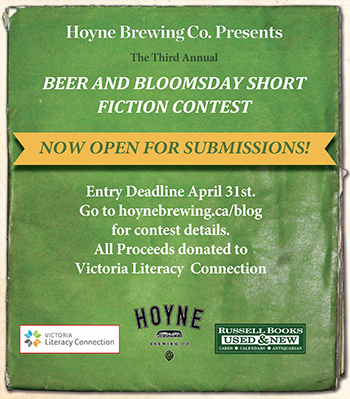 Victoria writers both established and emerging are encouraged to send us submissions! Note that the pieces don't have to be about Victoria itself. Deadline is May 15, 2017. Long Poem Prize Shortlist is Here! We are pleased to announce the finalists for the Malahat's 2017 Long Poem Prize! Two winners will be announced by April 7 on the Malahat website and social media pages. The winners will take home $1,000 and their long poems will be published in our Summer issue. A special thank you to this year's judges (George Elliott Clarke, Louise Bernice Halfe, and Patricia Young) and to everyone who entered the contest! There are short-story debuts that emerge into the world and merely hint at the promise to come. Then there are collections that arrive fully formed, as if the writer is no mere debutante, but has stepped directly into the literary spotlight, with an ace or two (or three) up her sleeve. 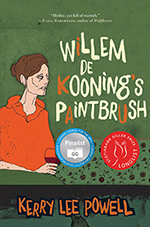 The latter would describe Kerry Lee-Powell’s first collection, Willem De Kooning’s Paintbrush. Call to Short Story Writers: Four Weeks 'til Deadline! The countdown is on! If you're an emerging short story writer who has yet to publish a first book (publication in literary magazines is acceptable), we want your submissions! Send us your best short story, max. 3,500 words, for a chance at the $1,000 prize and publication. This contest only runs every other year, so start writing! Contest entry fees are reduced to encourage new writers to submit: $25 Canadian ($30 US, $35 international) for one story, and all additional stories cost $15 each, no limit. This year's contest judge is Steven Price. Don't delay! Send in your best story before May 1. Malahat publicity manager PJ Grace talks influence, fearlessness, and the dark places of writing with acclaimed poet and novelist Steven Price, judge for the 2017 Far Horizons Award for Short Fiction. PG: The late American poet John Berryman said, "We must travel in the direction of our fear." As a professor of fiction and poetry, what has your experience been with emerging writers sticking to "safe" topics in their writing versus tackling the unknown, the strange, the luminous? SP: Hm. What would a "safe" topic be? I think everything depends on the writer, which is to say, on how a thing is written. All excellent fiction leads into the unknown, the strange, the luminous - even if it appears to be about the most mundane, the most familiar aspects of a life. A story about a toothache could terrify. A story about a serial killer could bore a reader stiff. I do think emerging writers are often fearless. I suspect Berryman was acknowledging the uneasiness we feel when writing our way into a place we can't see the end of, when we realize what was solid has started to give way, and we can only trust to the dark. The Founders' Awards acknowledge the longstanding excellence of The Malahat Review's contributors. Given out annually for the best work of poetry, fiction, and creative nonfiction to have been published in the magazine in the previous year, the Founders' Awards each honour a Victoria-based writer—Jack Hodgins, Charles Lillard, and P. K. Page—who has made, or continues to make, significant contributions in the genre or genres for which they are known locally, nationally, and internationally. The annual awards gift a $1,000 prize to each author. In poetry: Billy-Ray Belcourt for "Love is a Moontime Teaching"
In fiction: Lisa Bird-Wilson for "Counselling"
In creative nonfiction: Kelly Bouchard for "Women and Children"
See the announcement pages for interviews and judges' comments on the winning selections. April's Publishing Tip comes to you from Tara Wohlberg, founder of the online poetry journal, Cede Poetry. In this article, she discusses the difficulties of launching a new literary magazine in today's market, and the contradictory level of support from unknown audiences on the Canadian literary landscape. I launched Cede Poetry, a new online poetry journal, in the spring of 2015. Curiosity. I'm a Gemini. Also, a writer friend said I was nuts to try to launch a new model in these challenging times of poetic distribution. But I couldn't walk away from a triple-dog dare. Who isn't frustrated with the glacial timelines of so many established journals? In honouring various rules and regs, including non-simultaneous submissions, it can take Dear Writer a long time indeed to hear from Ms. Gatekeeper. Was there a better way of celebrating and disseminating poetry in 2015?